I haven’t been on social media since the end of July – it’s now late September – that’s a 7-week social media detox. 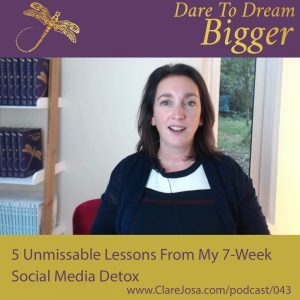 Discover why I went on my ‘digital detox’, 5 unmissable lessons I learned, and the life-changing thing I did with the time it freed up. I’d love to hear from you: does the idea of a social media detox resonate with you? Could you imagine yourself going on a social media detox? What do you love or loathe about social media? Want The Video Of Today’s Episode?